A big game hunter who won a Safari permit to kill an endangered black rhino has been granted permission from the US Fish and Wildlife Service to bring home the animal's head. Corey Knowlton won the safari permit at an auction, paying $350,000 to the Namibian government. Another permit was auctioned for $200,000, but the hunter who won it was not identified. Ironically, the money will go towards Namibia's wildlife conservation and anti-poaching efforts. The black rhino is a protected endangered species, with only 5,000 left on Earth. "United States citizens make up a disproportionately large share of foreign hunters who book trophy hunts in Africa," said Dan Ashe, director of the US Fish and Wildlife Service, in a statement. "That gives us a powerful tool to support countries that are managing wildlife populations in a sustainable manner and incentivize others to strengthen their conservation and management programs." Under Namibia's management plan, which began in 1995, the black rhino population has grown from 2,400 to 4,880 in 15 years. Prior to Namibia's poaching boom in the 1960s, the country had around 70,000 black rhinos. The program allows for the culling of five old male bulls to support younger males in mating and growing the population. There is a high demand for poaching rhino horns, since they are used as traditional Asian medicine in China and Vietnam. The horns can fetch as much as $50,000 per kilogram on the black market. Poachers’ attempts to retrieve the horns have hit news headlines, with some efforts leaving behind gruesome pictures of rhinos bleeding to death. Over 1,000 were slaughtered in South Africa in 2014. The brutal act is often done by subsistence poachers, driven by poverty or hunger, who then hand off the horns to a syndicate. 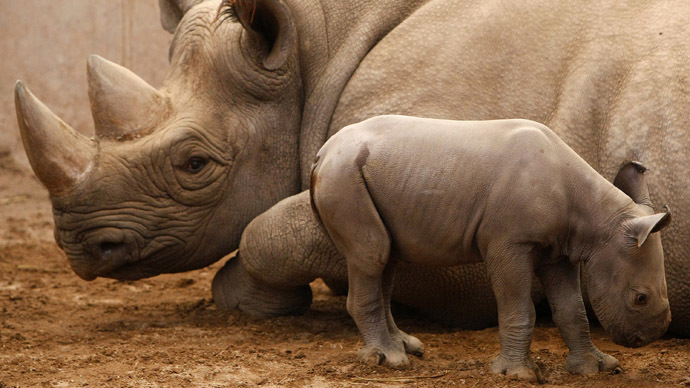 If the poaching continues, estimates by rhinosurvival.org say the rhino will be extinct by 2025. To date the US Fish and Wildlife Service has approved just three permits to hunters to return to the US with trophies. The first permit received little attention, but Knowlton's permit generated 15,000 public comments and 135,000 petition signatures from conservationists arguing against the culling of a species on the edge of extinction. "In this day and age, sport hunting of any critically endangered species - especially a species that is seeing massive rises in poaching incidents – cannot be supported," said Kathleen Garrigan, a spokesperson for the African Wildlife Foundation.